If you’re attending a writers conference for the first time, you might be tempted to be one of those silent observers and soak it all in. You’ll definitely get some value out of it to sharpen your skills and build confidence. But if you really want to give your freelance career a boost, making connections can make a big difference. When I went to the Tech Money Mama conference for freelance writers, I learned a lot. But I also showed up prepared to network, pitch ideas, and meet other writers, editors, and marketing professionals. 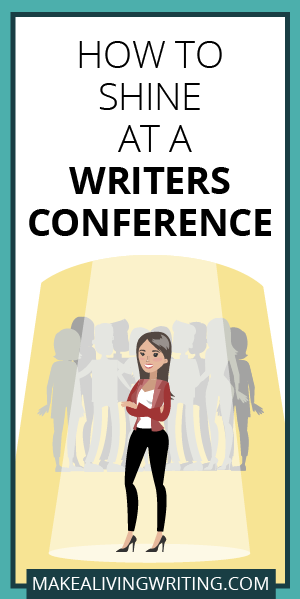 When you get to the writers conference and meet the presenters, or editors in person, it’s easier to strike up a conversation and ask about a recent blog post, article, or product launch, if you’ve looked up that info earlier. You might even reach out ahead of time to schedule a meeting, or use Twitter to live-tweet at the conference. Both are great ways to make industry connections. Let’s face it. A lot of freelance writing happens in isolation. Maybe you have phone calls or video chats with clients and sources, but the rest of the time, you’re probably working alone. So you need to be prepared for face-to-face, in-person conversations at a writers conference. Keep it brief. Follow up your elevator speech with a question like: What do you do? When you introduce yourself, it’s also an easy opportunity to hand someone your businesses card, and get one in return, so you can stay in touch after the conference. What’s happening in your niche/industry? What do you think about this story idea, blog post? Get to know people. At every writers conference, there’s designated times for networking. But you can also make connections during breaks, meal times, and after hours. Use those opportunities to get to know people. Connect others. If you meet a writer who has a specific skill set, and an editor looking for that kind of niche writer, make introductions. And you’ll make connections to grow your network. You can learn a lot at a writers conference about the business and craft of freelance writing, marketing, and industry trends. It’s one reason to attend. But every writers conference is also rich with opportunities to make connections with people who may want to hire you or send referral work your way. And it’s not that hard to do. Plan ahead. Get comfortable introducing yourself. Ask questions, and listen. Then follow up. That’s how to stand out from the crowd and shine at the next writers conference you attend. What are your tips for making connections at a writers conference? Let’s discuss on Facebook and LinkedIn. Lyne Carolynah is a freelancer writer with a passion for acting, culture, fashion, travel, and philanthropy. She is deeply dedicated to empowering young girls and women of color.